A huge highlight of #TMC16 was the array of energizing and inspiring keynote speakers. During the Desmos Pre-Conference, Sarah Vanderwerf exhorted us all to be Evangelists for mathematics. Sarah is a force of nature, and she spoke about Desmos representing the first paradigm shift in math education since the graphing calculator, making math more widely accessible (and beyond the school day) to students. When she told us to putDesmos stickers on our phone s so we could easily share the wonder that it is, many of us did. Right away. (That is, after we put on our socks.) Yesterday, my husband concernedly asked me about ‘those Desmos stickers on everything’. I love how he was blown away by a demo. The second keynote speaker, Jose Vilson, with whom I was privileged to run a workshop, began a conversation about the elephant in a room comprised predominantly of white teachers (as is the teaching force in America) – race, racism and equity as it is manifested in our school system. The significance of his speaking to us at #TMC16, held in the twin city of St. Paul, where less than two weeks ago, Philando Castile was shot by a police officer, could not be ignored. Jose is congenial and soft-spoken but his message was powerful. If we, the #MTBoS, represent a group of teachers who aspire to better teaching and true collaboration in service of our students, it is time for us to step up, examine who we are, acknowledge the inequities in the system in which we work, and speak up against them. [NOTE: this is my read on his message, and not a quote.] These are important words for us to hear. I know that I became a teacher in large part because I felt that it was one of the only ways that I, as an individual, might have an opportunity to effect some change, even if only for a few people. And given that this is my stated motivation, I feel an imperative to learn how to participate in this struggle. Others have had no choice but to struggle their entire lives. The following day we heard from Tracy Zager, who addressed the need for vertical collaboration among teachers. With great humor, she described an extended conversation on Twitter in which she, with a background in elementary education, ‘played math’ with some secondary teachers and professional mathematicians. She allowed hersel f to admit her need for help, and as a result, not only learned some new math, but found new colleagues along a vertical spectrum. To say that Tracy is a warm and engaging speaker (which is completely true) doesn’t truly describe the presence and timing she brings to communicate her message. 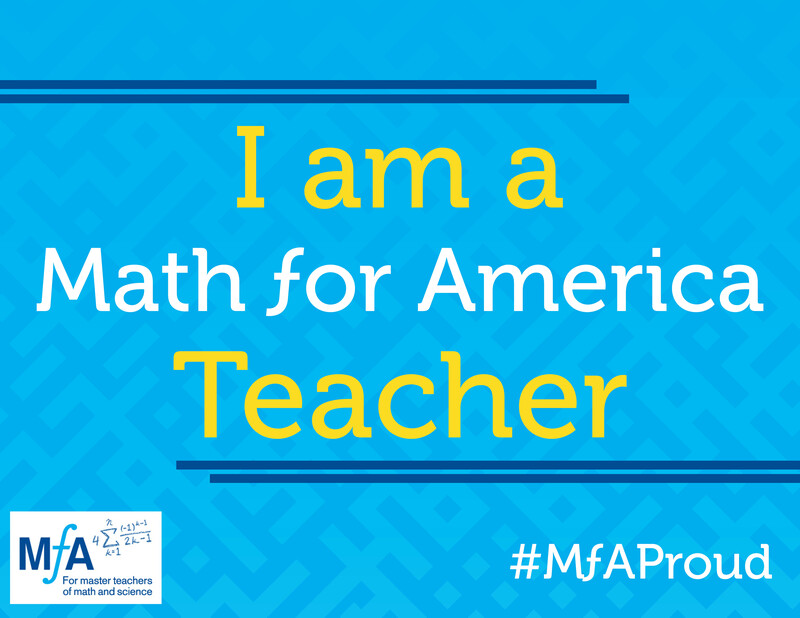 I was completely inspired by the idea of vertical collaboration among elementary, middle, and high school math teachers, and plan (and I’m putting it out there publicly to hold myself accountable) to propose a Vertical Collaboration Professional Learning Team at Math for America next spring. Dylan Kane, our third keynote speaker, honestly and humbly described some of his less successful experiences in teaching – the ones we’ve all had, in which we are confident that we are ‘following the recipe’ of good teaching that we have gleaned from somewhere, incorporating great techniques and innovative activities, only to discover that our students have completely missed the lesson objective, or that we have, perhaps in our enthusiasm to allow them to ‘discover and construct’ mathematical meaning, left them without a life (or math) net. I heard this message loud and clear; how many brilliant lessons have I ‘borrowed’ without fully thinking through the relationship between some creatively crafted activity and my students’ needs? Or whether someone else’s strategies were suited to my classroom, my teaching style, and/or my curricular goals? Dylan’s soft-spoken presentation delivered this important idea that is as true for new teachers as it is for veterans. Having missed the last two Twitter Math Camps, I felt compelled to actively participate in #TMC16 by giving back to this community that has been nourishing me professionally and personally, and submitted several proposals to present. [Confession: by committing to present, I was also ensuring that I had no opportunity to change my plans; as much as I wanted to attend, life circumstances can become overwhelming…] To my great honor, all three of the workshops which I proposed (or was part of a team of proposers) were accepted! And then I thought ‘Holy !%$#?*! – What was I thinking?’ I’ve run small PD sessions at school, but never before a group of esteemed and beloved peers like this! Yet again, the #MTBoS has pushed me to be a better self, and I would like to briefly recap my sessions. Problem Solving – A Self-Differentiating Course: This brief (30 minute) presentation outlined one semester course I taught last year for off-track juniors and seniors. Working mostly from the book Crossing the River with Dogs, we covered a different problem solving strategy each week, using accessible problems that grew more challenging as student mastery increased. Although the content in the book is very straightforward, there are many opportunities for creativity in planning and delivering this course, and the wide range of problems in the text supports differentiation without any kind of stigma or disruption – everyone is doing the same work. Thanks to supportive participants Meg Craig and Jennifer Fairbanks, my first presentation went smoothly, and calmed my anxieties (a bit). Racially Relevant Pedagogy: I was most excited about this session which Jose Vilson and I ran. I am on my own journey of learning how racism affects me (and perhaps manifests itself in my practice), and was looking forward to seeing how my colleagues began or continued on theirs. I know that the workshops in which I have participated have been powerful experiences, and I was hoping our session would be similarly effective. Just observing and listening to how people predominantly identify (by gender, race, class, nationality (ethnicity), or religion), and how their experiences have been shaped by these classifications was fascinating – and that was only our first activity. Our participants were open, honest, and thoughtful, and presenting with Jose was breeze. I was completely jazzed by the experience and would have loved to spend more than an hour talking with folk. New to Teaching: The Good, the Bad and the Truth: One of the best parts of this session was working with and getting to know Glenn Waddell and Amy Zimmer. This session was presented in the last slot of the conference. We had fewer new teachers than I had anticipated (thank you, Tom Hall! ), but we had a couple of teacher mentors and teacher educators, which made for a fruitful discussion. As part of our presentation, we collected data from all TMC participants (or as many as answered our survey) on their experiences as new teachers, and reading through the responses of what people needed most as a new teacher (an effective mentor was the top response), what topic induced greatest Imposter Syndrome (winner: probability), one word describing yourself as a new teacher (not surprisingly: overwhelmed), most embarrassing moment as a new teacher (all over the place, but crying in front of students, administrators, and/or parents showed up).